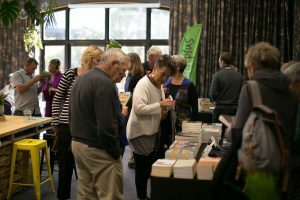 It wouldn’t be Aspiring Conversations without Chris Lumsden from Paper Plus Wanaka, who has been on hand every year since the festival started with his pop-up bookstore. Come see him in the Armstrong Room during the festival to check out a range of books written by our speakers, have a chat with the authors, and get your copies signed. Chris has always gone above and beyond to support the festival – including dressing up as a French maid in honour of the Dave Armstrong play Le Sud, which premiered at the 200 Festival of Colour (he had a selection of maid outfits airfreighted in to Wanaka for staff to wear). He said he is particularly looking forward to seeing Christos Tsiolkas’ session, which will feature Christos, the author of The Slap, discuss how writers are responding to the era of Trump and Brexit, and what the writer’s role is in society. “I really enjoyed The Slap and I’ve heard so many good things about Christos. That will be a great session,” Chris said. He added that one thing he enjoys about Aspiring Conversations is that there is always something that surprises him. For example, Chris read Andrew Dean’s Ruth, Roger and Me after seeing Andrew speak at the festival in 2015 with Shamubeel Eaqub, and said he found reading about his generation’s point of view fascinating. Buy a book from Chris during Aspiring Conversations and support our festival – Paper Plus Wanaka will be donating a percentage of the takings from the pop-up bookstore to the festival. Did you miss out on a speaker you’d love to see? Good news – we will be releasing additional tickets to some of our sold out shows next Friday, March 23 at 9am. You will be able to book online through the Aspiring Conversations website or by telephone on 022 4 849 669. For the first time this year, three of our speakers will be running sessions with students at Mount Aspiring College. Brent Williams, John D Potter and Jeanette Fitzsimons will all be visiting the high school to speak with students and encourage our young people to join the conversation! Thinking requires a clear head, and we are pleased that Anna from Queenstown’s Life’s a Grind will be bringing her coffee cart over the hill to keep us caffeinated with Allpress coffee over the Aspiring Conversation weekend. You may run into her outside the Queenstown Airport – stop in and say hello and enjoy a barista-made cup of java. 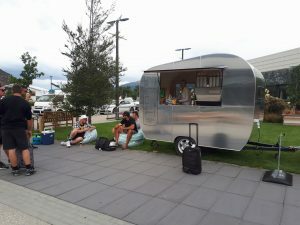 Wanaka’s reputation as a great place to eat is growing, and we have two terrific local eateries supporting us as local business sponsors.